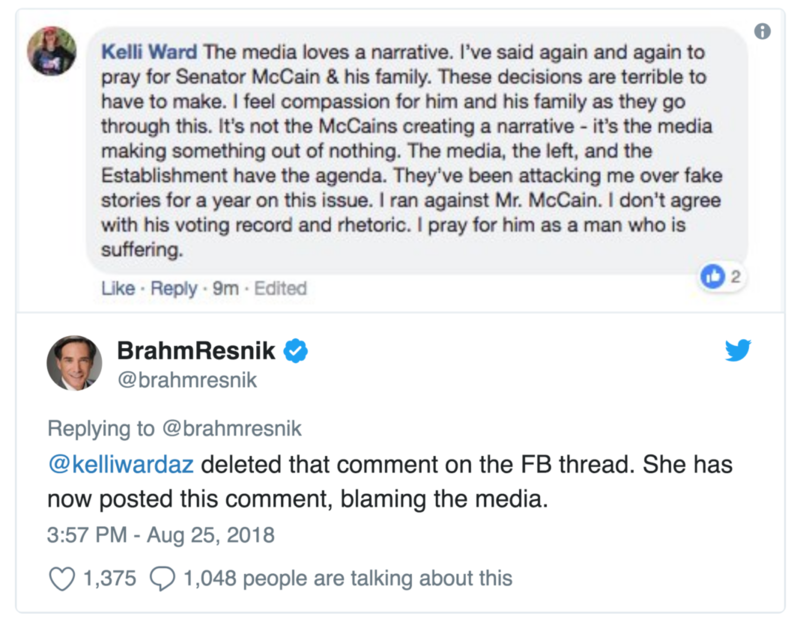 Kelli Ward has poorly handled John McCain’s death making it appear she thought it was all about her. She will never be elected to anything ever again, is my guess. Did Ward believe that the McCains, and their staff, had Ward in mind when dealing with the tragic death of their paterfamilias? Likely not. That would be insanity and narcissism of the most pernicious type. She likely meant the media in general by “they”, but it is certainly ambiguous because the antecedent was “Senator McCain released his statement…” and nothing about the media in general. Reporter Brahm Resnick caught the comment before the campaign (wisely?) deleted it, however, and then Ward made the bad worse by digging in rather than clarifying and apologizing. So, suicide by social media is accomplished by Dr. Ward. Now the headlines are rampant throughout the media about how she made McCain’s death all about her and her campaign. There is a kernel of truth there, even if overstated by the headlines. None of which now matters; there is a meme in the collective mind that Ward made McCain’s death about her and her campaign and it was her own doing, even if not strictly true. This is exactly how not to do campaign messaging during a crisis. Ironically, it was her own paranoia regarding media bias that led to the blunder that will consume her career. Ward is done as a political force in Arizona because of her maladroitness on social media. Previous articleAre the Russia Dots About to Connect? please explain why there is a campaign ad for kelli ward on this site??? I block ads, but I would assume you’re seeing an ad that was put there by WordPress, the company that is hosting this blog. Anyone can get a WordPress dot com blog, they’re free, and WordPress will put ads on your blog. That’s how WordPress gets paid for hosting your content. You’re most likely seeing the ad based on your IP address, which is like your house address but for computers on the internet, and I assume shows you live in Arizona. I’m assuming all this, of course, but I seriously doubt AZ or any of the other bloggers would intentionally place an ad for known idiot and racist Ward. Hey kids, remember when Ward set up an actual fake news website? She literally did what the Russians did to get Trump elected. I think the GOP lost its ability to comprehend irony when it went full KKK. Unfortunately, she represents what the Republican Party has descended to after 30 years of “dog whistling” and ignoring facts. The evidence is also found in McSally who has found the way to wind is to steer towards the alt-right. Useless, crazy, and just like the narcissist in chief. Now she is emphasizing the “Dr.” on her lunatic loop around the ChemTrail State. Crowds of a dozen are showing up. 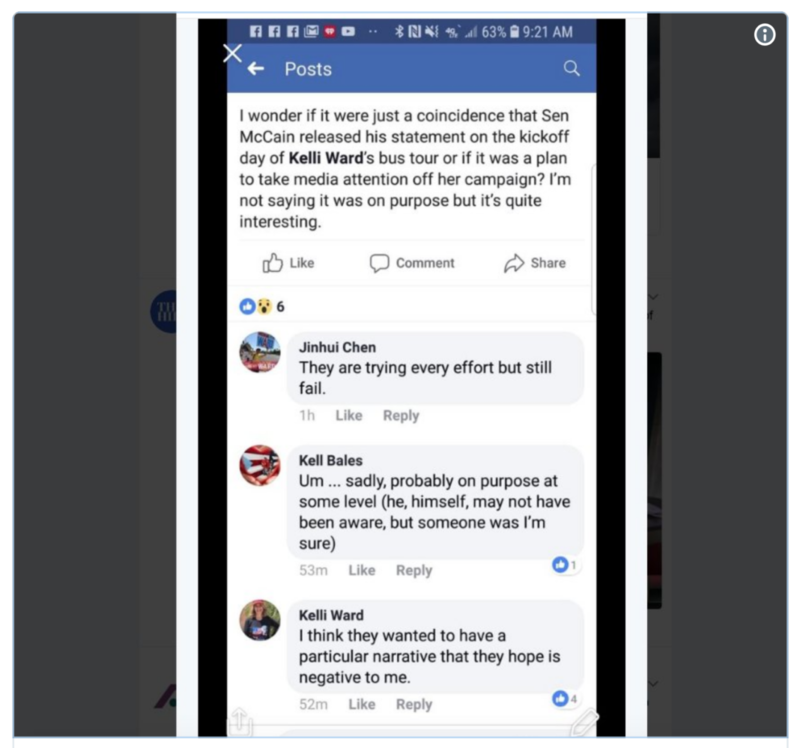 Maybe, just maybe, they dont want you Kelli, and your imaginary “marketbased” health system. That is your reality. Remember the vast majority of your Mohave County clients ARE on Medicare, VA, or AHCCCS. To be elected she still needs to go through general elections, which I doubt will ever happen for her now. Even if she tried to go back to the State Lege, I have my doubts that she would succeed. It’s Arizona, no one will care and vote for her anyway.